Atyaasaa engages interns from various national and international academic institutes. Interns get to understand the importance of infusion of energy, enthusiasm and fresh ideas by working along with high performing teams. Interns get selected on competitive merit through an elaborate selection process. A judicious combination of simulation, group work and interview ensures the right fit for a profile. The internship tenure is for 2 months. During this period, based on Atyaasaa’s needs and intern’s demonstrated competencies, they get to work in one or more areas viz. learning & development; HR processes; organizational development; marketing and sales process; financial analysis and modeling and some other frontline areas. Interns get the unique opportunity to work on niche live projects for world class companies and accumulate the much needed experience. Interns are able to build relationships with top notch industry professionals during project implementation. 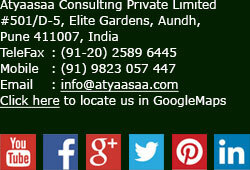 Performing interns have the chance to bag the coveted offer (pre-placement offer) from Atyaasaa. The learning during the internship period at Atyaasaa helps interns not only academically but also personally in shaping up their personality into a thorough professional. On successful completion of internship, the interns get a certificate and a stipend.